We want the May Day BBQ to feel like a family celebration and we want people to actively participate. In fact, the event won’t happen unless people come together and work to make it happen. Sharing food is simple and traditional way for people to connect with each other. We want people to eat even if they don’t have money to buy food. *BE SURE TO LABEL YOUR DISH & LIST ANY FOODS THAT CONTAIN NUTS, GLUTEN, or other allergens. The event is located in Schenley Park at the Vietnam Veterans Pavilion in the center of the park. The pavilion has a small kitchen, grills for bbqing, bathrooms and a playground. There is some parking throughout the park. We encourage visitors to use public transportation, LYFT or UBER to the event. Parking is limited and first come first serve. Everyone is welcome to attend the event. We chose the park because it is a family friendly public space. Children of all ages are welcome. 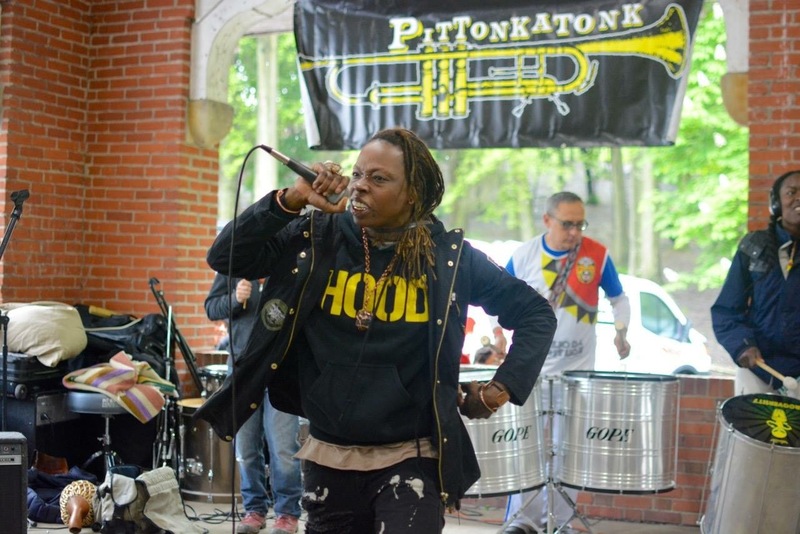 Pittonkatonk is a grassroots initiative to connect people through music and to use music to promote fair and just relations between people and society. There are different parts of Pittonkatonk. Our two big efforts are the Young Musicians Collaborative (YMC) and the May Day Brass BBQ. We support other select events throughout the year. First, we like the sound, especially Balkan, Banda, and New Orleans styles. Second, community brass bands have played an important social roll all over the world for centuries. You can hear them playing weddings, funerals, birthdays, parties, holidays — almost any time people come together. Third, they’re mobile and don’t require electricity or complicated sound equipment. We can have 100 musicians play for over 8 hours in a park and never do a sound check or blow a fuse. Only the Brass BBQ is once a year. We’re actually working year round with the YMC, programming small events, and, of course, administrative stuff. The Brass BBQ is the culmination of all of these efforts — the point where everything comes together. May Day is really on May 1st. Because of planning needs we decided to hold the Brass BBQ on the first Saturday of May, but it’s still May Day for us in spirit. 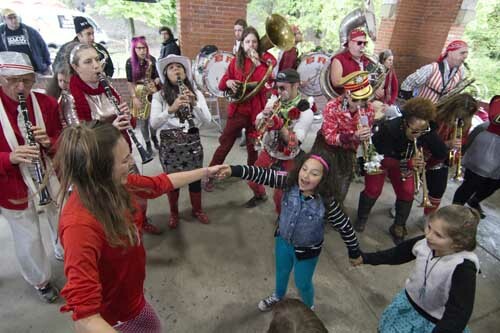 May Day is a traditional day for celebrating the end of winter with music, dancing, and food. It’s also International Workers’ Day and Pittonkatonk started as a dialog on how musical labor and music as a commodity shapes relationships and music making. The Brass BBQ grew as a way to put some of the issues we raised into practice. HOW DO YOU CHOOSE BANDS? We choose bands we like, have relationships with, and that we respect. That goes both ways and the bands we bring respect us and what we’re trying to do. 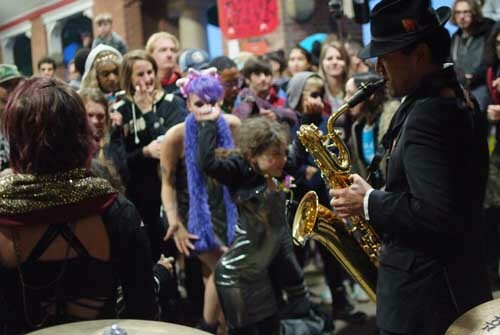 The street brass band movement has grown a lot of over the last 10 years and many groups directly connect their efforts to positive social change and civic action. That’s important. 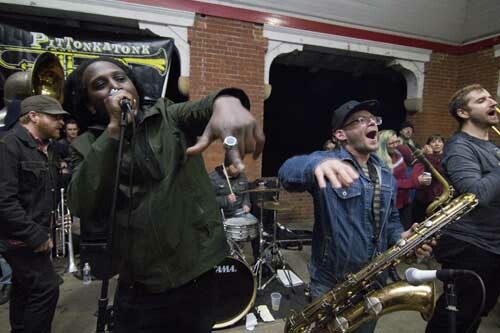 We try to bring groups to Pittsburgh that people have never heard. And we try to bring groups that we think will activate different communities in Pittsburgh and get more people involved. WHY DON’T YOU SELL TICKETS? We’ve become accustomed to money mediating our musical experience. We’re making a conscious effort to do something different. Pittonkatonk is an effort to create a space where people can come together without buying tickets or being sold to advertisers. We know that not everyone is interested in the May Day Brass BBQ, but we’re trying to make sure that everyone who is interested can participate. 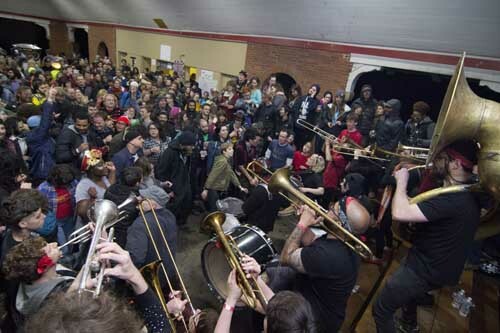 The Brass BBQ isn’t free — we pay bands, rent the space, pay for permits, insurance, and so on. We ask people to support the event to the degree they can, but not in a fixed way. Many people help by donating money to cover these hard costs, which is great. 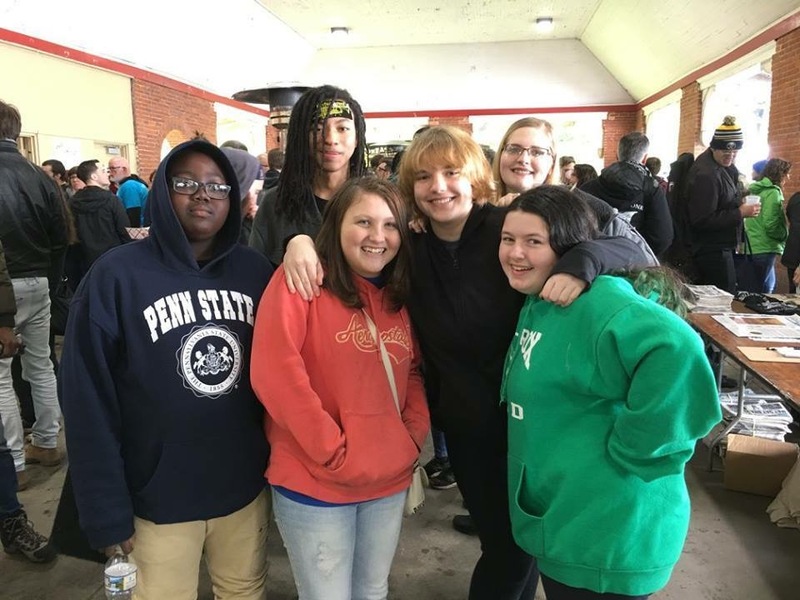 Others help by hosting bands, lending parking permits, providing services, bringing food, doing administrative work, and helping clean up (just to name a few ways). Honestly, we just want to see if this can work. 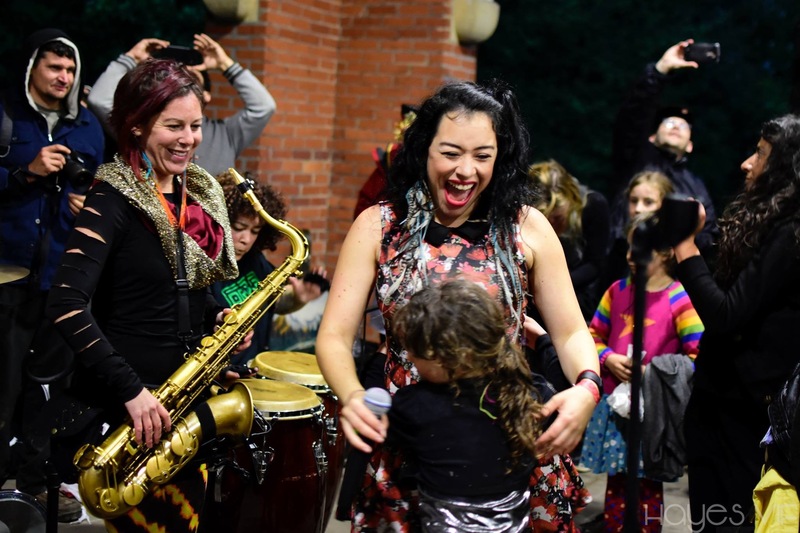 We want to have a sustainable series of musical experiences that are fun, inclusive, enriching, empowering, and that benefit people in our region. We want to contribute to our city’s vibrant music scene by bringing amazing bands that get people excited and we want to do it in way that maximizes music’s social value and minimizes boundaries and barriers. 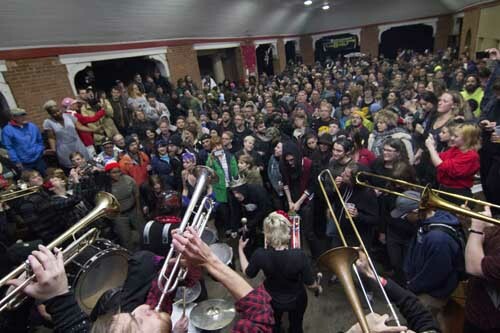 Pittonkatonk is a free, outdoor, family friendly community celebration of brass music that features both local and touring musicians. Held at the Schenley Park Vietnam Veterans Pavilion, Pittonkatonk blurs the lines between music festival and family reunion. There’s no formal stage, no ticket prices, and no barrier for entry. 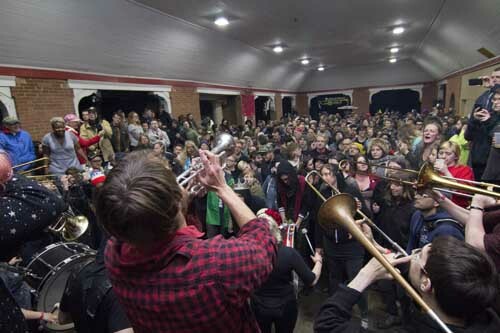 Instead, bands play in the crowd with little to no amplification. The community creates a potluck table of food donations for refreshment, and folks of all ages can be seen dancing together. 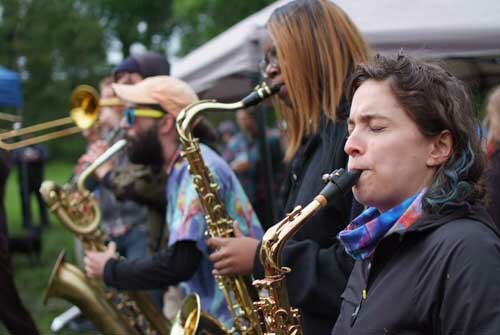 This day-long event features all styles of brass music including Balkan, New Orleans Jazz, Symphonic, and street/protest/punk bands. Its success is due to a large outpouring of support at all levels, from individual donations to community partnerships. Pittonkatonk Education Program (PEP!) 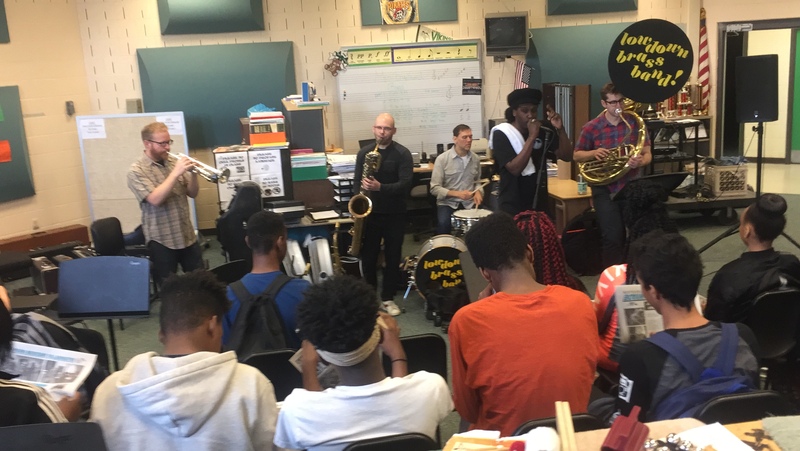 connects local teen musicians with national and local musicians and educators. 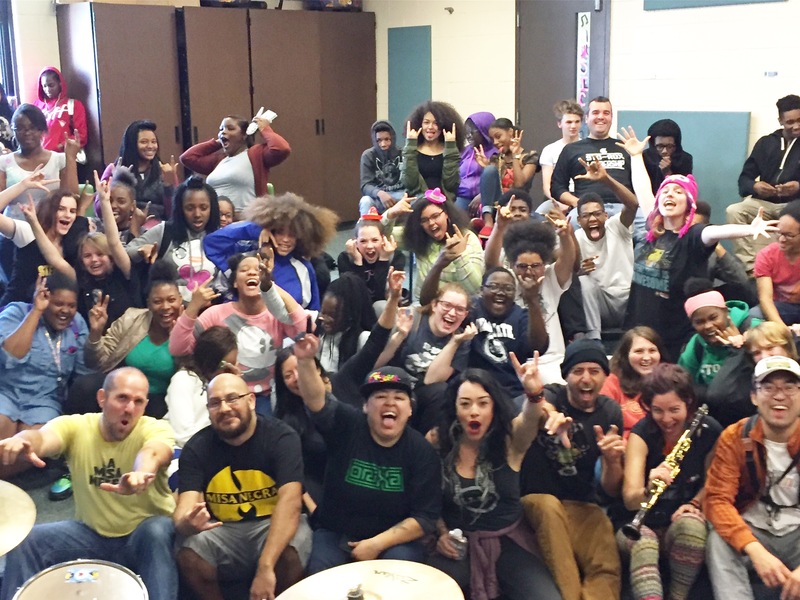 Our goal is to empower kids to use their love of music to engage the world around them and to use music to achieve positive social and political outcomes. Visit our EDUCATION page for more info.